There are so many beautiful places to along the Oregon Coast, planning an Oregon Coast road trip can be difficult. How do you choose which places to stop at and which ones to drive past? How can you fit everything in during a short period of time? To help you choose your route, I’ve listed the places we stopped at along our road trip from Cannon Beach to Florence, plus some extra ideas based on what we saw from the car window! In April of 2018, my husband and I went visited Portland, Oregon for a week. Before we started exploring what the city and surrounding areas had to offer, we headed to the coast for a weekend road trip. Our tour of the coast began at Cannon Beach and ended in Florence, Oregon. 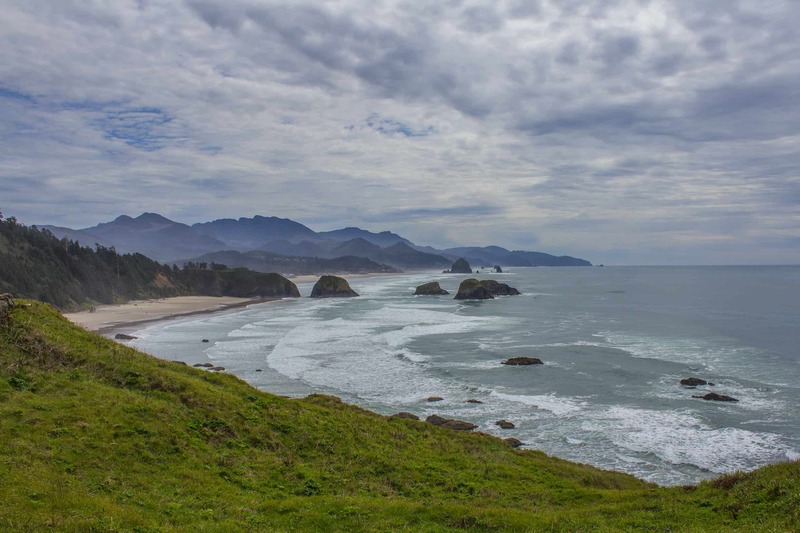 If you only have a short time to drive along the Oregon coastline, consider these stops! Cannon Beach is most known for the Haystack Rock, a picturesque rock formation jutting high into the sky along the beach. Although the beach is what draws most tourists to this small town, there’s more to do and see than hanging out on the beach! For a more detailed look into what you can do with 24 Hours in Cannon Beach, check out my post, here. Spend some time on the beach building sand castles, watching sunset, enjoying a fire, and admiring the massive rock formation home to hundreds of common murre birds. There are several small boutiques, restaurants, and coffee shops to hang out in when you need a break from the outdoors. For ideas on where to eat, check out my post on Cannon Beach, here. A short drive north of town is the Ecola State Park with beautiful views of Cannon Beach and hiking trails along the coast. Before you leave Cannon Beach, make a short stop at the Silver Point Interpretive Overlook for one last view of Cannon Beach and Haystack Rock from afar. The exact location and photos can be found on my post about visiting Cannon Beach, here. (1) Rockaway Beach. There are a lot of restaurants and a long stretch of beach, making it a great spot to stretch your legs and eat lunch. For more information on Rockaway Beach, click here. (2) Nestucca Bay Wildlife Refuge. If you’re a bird lover and looking for a nature-filled vacation, add this wildlife refuge to your itinerary. We watched hundreds of birds soaring over the refuge as drove past. There’s more to do here than just bird watch, too. There’s also hiking and kayaking opportunities. For more information, click here. (3) Devil’s Lake. There are a lot of places along the Oregon Coast with “Devil” in the name. Maybe it’s because they were dangerous for explorers, but I like to think that even the Devil wanted to stay in Oregon because its so beautiful. We drove around this lake on our way to our first stop. If you are camping (or want to stay in a yurt) on your road trip, there is a state park along this lake, making it an ideal stop on your itinerary. For more information about the park, click here. (4) Depoe Bay. This town seemed very popular. Restaurants with ocean views lined the main road, there’s a long stretch of beach, and lots of small hotels. But, the reason I suggest it is because you can play in a Mud Flat Golf tournament during April! Lincoln City, hosts a community days event and playing golf on the mudflats in Siletz Bay is one of the events. I had difficulty finding information about this event, but here is one article. But if normal golfing is more your style, there were a lot of golf courses in this area. Our first stop on the road trip was in Otter Rock to see the Devil’s Punchbowl. It’s a small park, so unless you plan on visiting the beach, plan on spending less than 30 minutes here. Or, you can have a picnic at one of the many picnic tables or eat at Mo’s Seafood restaurant (it will be busy). Also, there are public restrooms at this park. There is a limited amount of parking available. If you’re lucky you can snag a spot close to the park along the road, but most likely you’ll need to turn down Ave C and park in the small parking lot. Or, turn down an unmarked road between Ave C and Ave B for additional parking. Walk through the park for views of the coastline before reaching the Punchbowl (aka the Arch). You can look down into the Punchbowl from the park. Another option is to go inside! We had no idea this was an option, otherwise we would have planned to do so. If you want to walk around inside the Punchbowl, do so only at low tide! Beach access is across the road from the restrooms. Based on a photo I saw, it appears the trailhead for access to the Punchbowl is down Ave C, past the parking lot. There should be a sign. If you want to find your way inside the Punchbowl, click here. For more information about the park, click here. Before leaving, pick up a bottle of wine for the night! Do a little wine tasting and buying at the Flying Dutchman, located straight across from the park. We purchased a bottle for our overnight stay at the Heceta Lighthouse Bed & Breakfast. It was perfect because we were able to share our wine with other B&B guests. Between Beverly Beach and Agate Beach is an undeveloped stretch of beach, Moolack Beach. If more beach time is on your list of things to do along the Oregon Coast, pull over here. There is camping available in Beverly Beach State Park. Hours: Park grounds open at 8 am in the Spring and 7 am in the summer. Closes at 5:30 pm during the week, at sunset Friday-Saturday. Yaquina Head Lighthouse was first lit in 1873 and became the tallest lighthouse on the Oregon coast at 93 feet tall. Pay the fee at a small ranger station before entering the park. The road forces you to enter the parking lot for the visitor’s center. If you plan on taking a tour, this is where you’ll park. But, if you just want to walk around outside, keep driving around the parking lot back to the road. There is a small number of parking spaces near the lighthouse (if its full you can come back to the main lot). There are steps leading down to the beach from the small parking lot near the lighthouse, too. Tours of the Lighthouse are approximately 45 minutes long. We didn’t have time to squeeze in a tour on our road trip, so we just walked around and took some photos. If you plan on taking a tour, click on the link above for info and be prepared to walk up 1124 steps. Tip: It is extremely windy here! Be prepared to leave hats in the car or put your hair in a pony tail! Our original plan was to eat lunch at a hotel located on the coast, overlooking the ocean. Unfortunately the Lodge at Otter Crest restaurant was already closed until dinner by the time we arrived. Instead we went to the Yaquina Head Lighthouse and then stopped for a late lunch in Newport (recommended to us by the staff at the Otter Crest). Located on Yaquina Bay, this restaurant offers lunch with a view. There’s also entertainment in the form of sea lions! If you sit outside on the deck you can watch sea lions fight over the best sunbathing spots. They’re kind of jerks and overly dramatic but its fun to watch. If there’s a wait when you arrive, stroll along the pier and watch the sea lions or take in views of the bay. Next door is a gift shop with an underwater aquarium (which we didn’t have time to check out because our table was ready as soon as we entered). Across the street is a candy store, so you can purchase dessert before lunch. Newport was very busy when we visited in mid-April. I imagine this town is very crowded during the summer months. Parking is limited, but there is a small parking lot across the street from the restaurant, next to the candy shop. We were lucky and found a spot when we arrived. Aside from looking at the ocean flowing into the chasm and walking down to the beach and tide pools, you can hike the Restless Waters trail from the Devil’s Churn parking lot. For more trails in the Siuslaw National Forest, click here. My only regret from our road trip was arriving at the Devil’s Church at a time of day when the sun was low enough to whiteout my photos, but not low enough to make staying longer worthwhile. If we had arrived closer to sunset or before 5 pm I think it would have been a much more enjoyable experience. Unfortunately, since we arrived when we did it was difficult taking photos in the direction of the sun, which was hovering above the ocean. First road trip learning experience! Hours: Friday – Monday only; 11:00 am – 3:00 pm (winter hours 11 am – 2 pm). From May – September tours are offered on Tuesday and Thursdays. To visit the most photographed lighthouse in Oregon, park at the beach (entrance is right before the bridge!). There is a short trail uphill from the beach. You’ll pass the bed & breakfast and follow the path to the left towards the lighthouse. During the month of May you may be able to see whales from here! We left the Devil’s Churn Scenic Overlook after only a few minutes because we wanted to spend some time at our bed & breakfast before dark. Check out my post from this location and find out why you should stay at the Heceta Lighthouse Bed & Breakfast! (Note: if you plan on staying at the B&B, turn onto Summer St., before the beach access). For more information about the lighthouse, click here. The last stop on our road trip before heading back to Portland, was the Sea Lion Caves in Florence. It may be a very touristy place to visit, but I remember coming here as a kid with my family and wanted to revisit with my husband. Plus, I love watching sea lions. The Sea Lion Caves is a privately owned wildlife preserve with the largest sea cave in America. The Stella sea lion can come and go as it pleases from the cave and the rocks along the coastline. How many you see on your visit, if any, will vary. We went on a day when there were over 100 in and around the cave. There is also a lot of information inside the cave so you can learn about the sea lions. Before taking the elevator down into the cave, head down the cliff for a scenic view of the coastline and more sea lions on the cliff ledge. Inside the cave, there is another scenic view! From here you can see, beyond a waterfall, the Heceta Head Lighthouse. Tip: There is a small viewing area into the caves, so if you don’t want to fight for photos, get there early. There is a small ledge where you can rest a travel-sized tripod (like the Joby GorillaPod) to help you take long-exposure shots. No flash photography is allowed! What other stops do you recommend on an Oregon Coast Road Trip itinerary?